Most of us would have felt overwhelmed at some point of time at work, you feel like you're falling behind in your own business or career. You avoid meeting friends because you don't want to talk about what you've been doing, which can be frustrating. 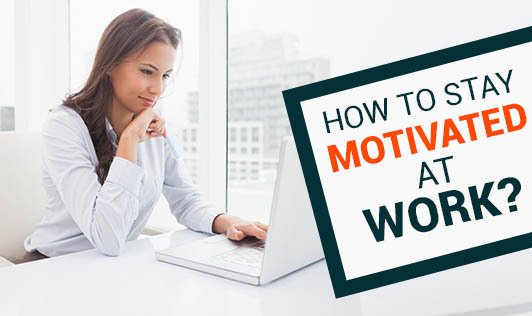 There are certain things that can contribute to your work being motivating or not, but once you identity them, you then have the power to remodel your workday in a way that gets you moving! Personal motivation is the key to maintaining all aspects of life. Decide what you must achieve today and identify the task: Having clarity is power as it allows you to operate in a peak state of concentration and will help ensure you are at your best. You will be astonished at how much you will get done and how successful you will feel when you focus. It's important that you define the specific goal and focus on it until you have achieved it. Break down complicated goals into manageable ones: Take the project and list down the sequence of steps that you will need to follow. Ensure that the steps are big enough to retain your interest and not so small that you feel exhausted and bored by the outlook of moving ahead with the project. Tracking time encourages you to make a game of getting things done correctly and promptly. Make use of negative pressure to keep you on track: Firstly, pick someone at work that would be kind enough to check your progress during the day. Ensure that this individual has a positive outlook and is fully supportive of your goal to achieve more. Now, choose someone you want to impress with your productivity and abilities. The secret to this strategy is that you use negative pressure to keep you on track, which means, you don't want to dread the vision of failure because you don't want to lose the approval of a person you want to impress with work. Also, the desire to avoid embarrassment will drive you to give in your best. Make it a point to implement the above and you can see your productivity improve!